Todays entry is a little different. Its not just one person! I know thats not what most people would expect a church minister to say but I really do. My reflections of previous Bourne Free's can be found here; 2014 or 2013 or 2012. As you know I'm not a fan of sharing others peoples stories but I will say that yet again we met some amazing human beings, ones that we laughed with, cried with, danced with, shared food with and enjoyed spending time with. This year Lizzie joined us to see what all the fuss was about and wrote her own reflection on what she encountered that is well worth checking out here. I find myself saying a big amen to the things she wrote so won't waste your time regurgitating them here, go check out her stuff 1st hand. There is a fair amount of thank you's though that need to be said! Bourne Free isn't an event, its a community. So thank you to all the trustees, that give up so much time, energy and love to make it what it is. I know they juggle many different things all year round to be the fabulous hosts they are. They must be shattered this week! Thank you to all the volunteers who take on numerous roles, they set up the space, they clean, they steward, they smile and they make it feel safe. Thank you for all your giving! Thank you to all the emergency services that help the weekend go smoothly. 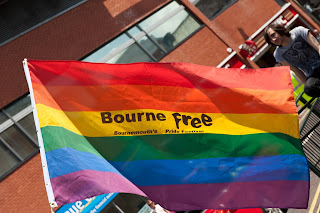 We really value the way you keep us safe and join in with the spirit that is Bourne Free. Thank you to Gay Pride Pics for taking thousands of photos, capturing some beautiful moments and enabling great memories of a fabulous weekend. Thank you to the amazing team at Over The Rainbow for the wellbeing enclosure, we really think you are ace! Thank you to all those bar/cafe/kiosk staff who worked their little butts off all weekend serving the thousands of extra customers that appeared over the weekend. Thank you to all of you those of you that sang, danced, rehearsed and rehearsed to put on a truly amazing show. Thank you to all the stall holders in the gardens for your preparation, information, freebies and for standing for hours. Thank you to all those people who bravely came and spoke to us, those that shared details of their journey. We really do appreciate the privilege it is to be able to hear your stories. Thank you to all those that came and hugged us. We hope you enjoyed the hugs as much as we did. It was all rather lovely! Thank you to Nina, Jim and Nikki from Liberty Church Blackpool for joining us and for all your encouragements. And to everyone who attended, thank you for being part of a unique, vibrant weekend. It was full of joy, hope and happiness.